The wait is over. ALLEGIANT concludes Veronica Roth’s bestselling dystopian trilogy, and it pulls no punches. In DIVERGENT and INSURGENT, the first two books in the series, Tris Prior encountered the insanity inherent in splitting society into factions according to salient personality traits. There are the Erudite, who value intellect; the Candor, who value honesty; the Amity, who value peace; the Abnegation, who value selflessness; and the Dauntless, who value bravery. Born into the Abnegation faction, Tris learned during her Choosing Ceremony that she had an aptitude for Abnegation, Erudite and Dauntless, which makes her Divergent, a dangerous classification in a society built on conformity within factions. Tris chooses Dauntless and attempts to hide her Divergent nature. By the end of INSURGENT, we learn that a world outside of Chicago, the city of factions, exists. ALLEGIANT takes Tris, her love interest Tobias and the rest of her comrades outside of the fence. There, they find explanations for the structure of their city and uncover more divisions in the fringe land beyond their city borders. More than ever before, Tris must interrogate the value of labels, the mechanisms of oppression and the lengths to which she will go to save the people she loves. "Roth has delivered a conclusion that asks readers to think about the effects of categorizing people and the violence that such categorizations can inflict, no matter how benign the intent behind such classifications." ALLEGIANT carries the themes established in the first two books to their end. After the events of INSURGENT left the Factionless in charge of Chicago, Tris and her comrades are dismayed to see that Evelyn, the leader of the Factionless, is setting up a society no less oppressive than the one she worked to dismantle. The Factionless, angry from years of being the outsiders, begin a governance of enforced conformity. They expect every person to dress in a combination of all of the colors and styles from each faction. Those who cling to their identities as members of a certain faction face the consequences in beatings and threats. Frustrated to have helped overthrow one oppressor only to instate another, the people who oppose Factionless rule begin to retaliate. 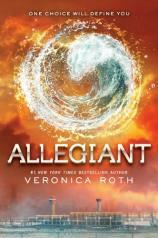 They call themselves the Allegiant, hence the title of the book. This type of grey morality appears several other times throughout this story. While Tris spent the first two books learning about the shortcomings of the faction system, she and her friends now propose a return to that system, but without all of the extreme division and antagonism that led them into a state of war. But the death of a friend spurs them into action, and Tris and the Allegiant leave the city to look for other people who may be able to give them answers. While the exposition can feel a bit heavy and the scientific explanations unlikely to hold up to scrutiny, Tris learns information that helps to explain why her society in Chicago endured such a strange social arrangement. The group in which she finds herself in the fringe land has its own problematic hierarchy, and Tris and her friends struggle to find the best way to stand up for the oppressed group. Tris and her friends recognize the importance of the various labels with which they have defined themselves only when those labels are questioned. (What will Cara be if not Erudite? What will she be if not Allegiant?) There is comfort in labels, but also constraint; Tris and her friends all must confront the threat to their labels in their own ways. Unlike the previous two installments, ALLEGIANT alternates between Tris’s and Tobias’s points of view. This gives the reader unprecedented access to Tobias’s mind, and we learn more about his complex feelings toward his family and his constant fight to be rid of fear. This technique also allows Roth to separate Tris and Tobias to give the reader glimpses of events in more than one place at a time. Another technique involving hidden cameras allows us to see the happenings in Chicago while our narrators are in the fringe outside. An old journal gives Tris insight into a figure from her past. This dispersion of narrative perspective enables Roth to build her character arcs so that the ending resonates as much as possible. In ALLEGIANT, Roth has committed to telling a war story, with all of the grey morality, social injustice and, yes, death that comes with the territory. Death comes suddenly and almost randomly for several characters who have been with us since DIVERGENT. Fans will disagree on whether these deaths were satisfactory, and the debate will be half of the fun. Roth has delivered a conclusion that asks readers to think about the effects of categorizing people and the violence that such categorizations can inflict, no matter how benign the intent behind such classifications. We are in danger when we relegate a person to being one thing only and forget the complexity inherent to human life. Tris, Tobias and even some of the characters previously considered villains have internalized this lesson by the end of the series, and it will stay with readers after they have turned that final page.